2. USA NIOSH approval (Approval number: TC-84A-4175) for N95 mask respirator. 3. 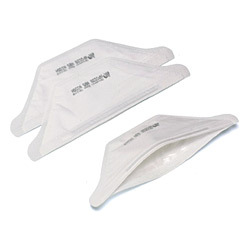 N95 Duck Bill type MASK - Foldable design and easy carry / storage. 4. The unique design of the shape with adjustable nose wire fit different facial shapes with minimum leakage. 5. At least 95% filtration efficiency against solid and liquid aerosols that do not contain oil. 6. High filtration efficiency (over 99.99%) with very low breathing resistance and long life time for use. 1) Defense against influenza (avian flu, swine flu) and TB exposure control. 2) Reduce wearer exposure to the spray, aerosol of blood and body fluids or non-oil-based particles in a wide range of industrial or clean-room applications and potential contamination.